With the exception of Taiji, Wing Chun is probably the most popular Chinese martial art right now. It is estimated that there are as many as two to three million of people practicing Wing Chun around the world. However, there are very few female instructors for the art. 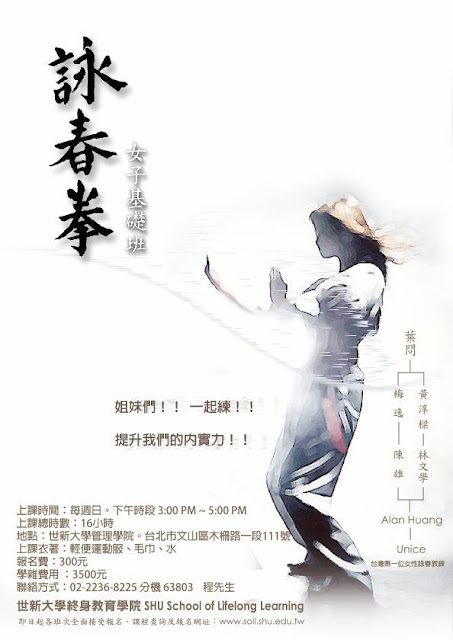 This is a kind of shame that the legend has it that Wing Chun is created by a woman and it is a great martial art for woman to practice. In Taiwan , as far as I know, there isn’t any female instructor at this moment. Hopefully, this situation will change soon. One of my female students, Unice, is opening a Wing Chun class just for women at the Shih Hsin University . For those females that prefer a female instructor or a fully female learning environment, this is something you might want to look into.